This post is the continuation of my previous last post, I had explained how to create a basic RESTful web services API using Java, now I want to explain JSON transformer to work with input Get and Post methods parameters. Just added a new class called transformer it converts object data into JSON text output format. Sample database messages table contains three columns msg_id, message and user_id_fk. Download Project Source link contains all these JARs. Previous Tutorials: Java MySQL Insert Record using Jquery. 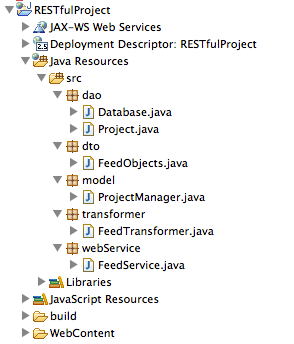 and Java MySQL JSON Display Records using Jquery. Package structure for more details please check my previous java tutorials. Create a new package called dto (Data Transaction Objects). Created transaction objects title, description and url. Explained generating Getters and Setter methods in this following tutorialJava MySQL JSON Display Records using Jquery. Create a dao(Data Access Object) method GetFeeds with Arraylist datatype, using select statement getting results from messageses table where user_id_fk. Binding results into feedData object. Model class write the business logic and data validation. Transformer class converts Java object result into JSON text format. 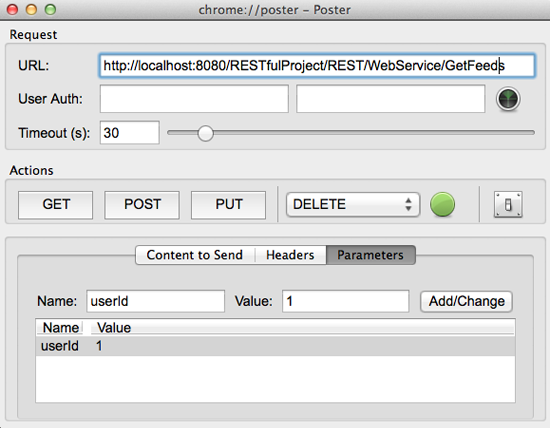 Web Services class for RESTful API. If you want to convert GET to POST just do little change. You can test post method with Mozilla Firefox Add on Poster. Here RESTfulProject is the project name, REST is the web.xml servelt mapping name, WebService is REST API path and GetFeeds is the method name. Note: For checking POST URLs user Poster extension for Chrome and Firefox. Next post I will explain friendly RESTful web services with path inputs parameters. Wow!I like you Java tutorial. Do you know a good and cheap Java hosting. 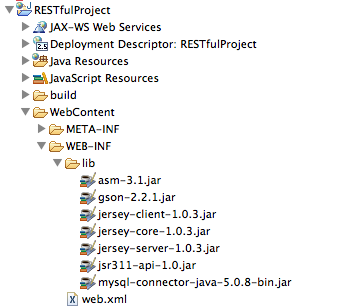 Why not use out-of-the-box JSON conversion that Jersey does? Additional manual conversion to Strings is completely unnecessary in this example. REST has had such a large impact on the Web that it has mostly displaced SOAP- and WSDL-based interface design because it's a considerably simpler style to use. and convert json it produce "5" is this correct output? output is "5" is it correct result ? I'am searching for this from two days and finally got it from you. I used this tutorial for accessing web services in Android. please post the steps of creating webservices using same example in Net Beans IDEs. how to created websevices using posted example??? Please post the steps of creating webservices. where did you passed the driver name and url for the connection?? Hi, everything works great!!! Great code. When I want to change GET to POST the code doesn't work, User_Id give me null value, can you help me. Can any let me know why?? where the userId param come from ? Its very useful to understand restful web service. "SEVERE: The ResourceConfig instance does not contain any root resource classes"
Already trying this fix i found on other post but it doesn't work. Hi srinivas, I am trying to develop java code for searching the bugs in bugzilla using bugzilla rest api method(/search) the link for bugzilla rest api method is https://wiki.mozilla.org/Bugzilla:REST_API:Methods#Search_for_bugs_.28.2Fbug_GET.29. Can you let me know how can i develop java code for searching bugs with description as parameter. Any idea how to fix it ? The json result is not coming in browser panel, displaying only console. How to get it in browser? Please write one restful service to upload a file containing data to import into mysql server.